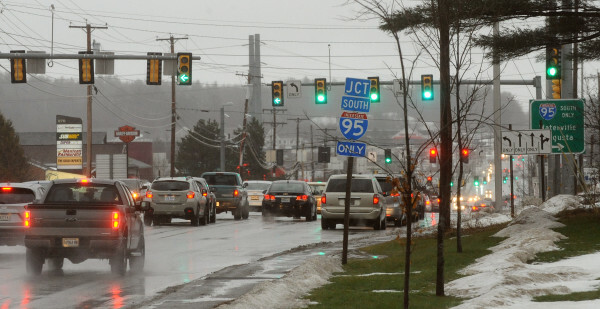 Traffic moves along Stillwater Avenue near the Interstate 95 southbound ramp in Bangor in this December 2014 file photo. AUGUSTA, Maine — Put down that mobile device while driving, or pay for it dearly. That’s the message Maine State Police have been sending over the last six months, according to Department of Public Safety spokesman Stephen McCausland. McCausland said Monday troopers have issued about 1,080 distracted-driving citations as police continue to crack down on texting and other forms of distracted driving. Of that amount of citations, 429 were for texting and driving, which included 54 commercial truck drivers for using hand-held cellphones. Commercial drivers are only allowed to use hands-free phones, which does not apply to drivers of passenger vehicles. The fine for distracted driving is $119, and the fine for a first offense of texting while driving is $310, which goes up to $610 for a second offense. State police have received two federal grants totaling nearly $300,000 to conduct enforcement of distracted driving, with a variety of unmarked cars and sport utility vehicles used to monitor traffic, McCausland said. Enforcement will continue throughout the year.